Ok winter is starting to set in and it is getting very cold. I’ve started putting the wood heater on earlier (…or the children are putting it on before I get home) and my little supply of quilts are being used to keep us warm. I have still to finish a few quilts and have some quilt tops completed on the view to complete them. I have just completed another quilt. I had a lovely range of Surrounded by Love by Deb Strain. It is very lovely range with pinks, reds, and whites and as a the name suggests, has a love theme. I looked around for a lovely quilt pattern using a layer cake pattern, and I found one on the Moda Bake Shop. The pattern I used is called The Dark Side…or Not Layer Cake Quilt and uses as you have guessed Layer Cakes. It was basically designing Half Triangles and arranging them in a lovely pattern. Sometimes I think we see a pattern with all good intention to do the pattern but it is a lovely to see a final product finished. I now need to find some backing material and decide on the pattern I want to put on the quilt. I have a few left-over layer cake pieces that I will use on the back of the quilt. I found the Clover Fork Pin were very useful in helping with the joins. I’m so happy with this quilt…..what do you think? P.S. it seems that every time that I take a photo of a quilt one or both of my babies jump in to be part of the photo. 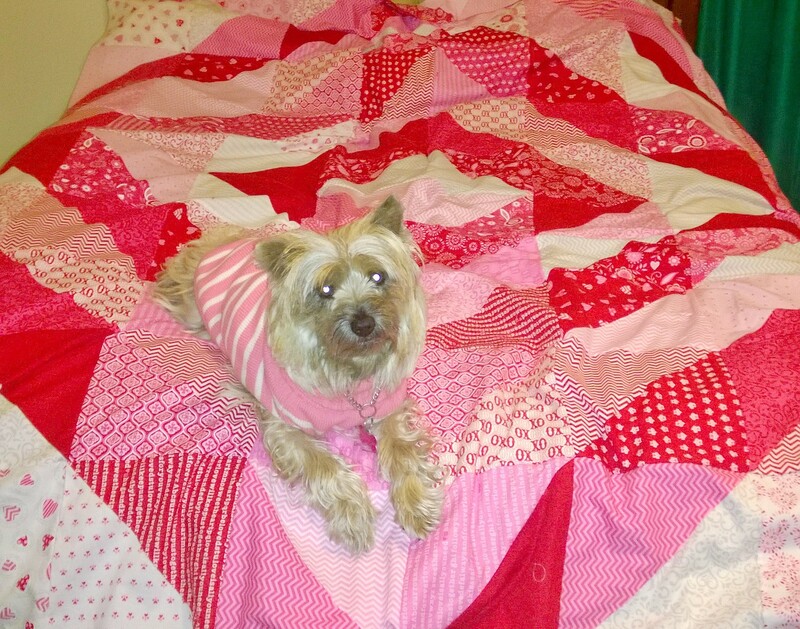 The dog in this picture is Gabby and she is a Cairn Terrier and she loves her quilts. I’m starting to think it is a requirement to have a pet in the photo of your finished quilt or quilt top.